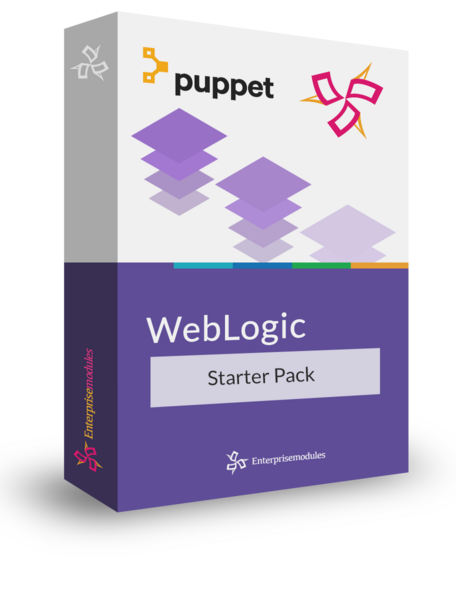 The FREE WebLogic starter pack allows you to use the FULL set of WebLogic classes, defined types and custom types provided in the wls_install and the wls_config modules on your own systems for a period of 1 month. This allows you to test the modules in your own environment and see how they help you to take control of your WebLogic configuration. To use the Oracle software you need a separate license provided by Oracle Inc. Check the Oracle price list to buy a valid license for your system(s). The WebLogic starter pack contains entitlements to use the wls_install and the wls_config) modules. You can try out all custom types and Puppet classes and defined types in your own environment. This way you can try out the functionality of the modules and experience the benefits of fast and consistent deployments. Check out the links to the individual products for more details and documentation. Puppet helps a lot to install and manage installations . Especially in large enterprise installations. But we know from our customers, that it is difficult to get started. There is so much to configure and so much install. It is hard to figure out where to start. To help you get going, we have implemented some extensive examples. We are working to make these example so comprehensive that they can serve as a reference implementation. We have structured these examples so that you can run them on your own PC. We use VirtualBox and Vagrant to get the systems up and running and after the initial boot, we let Puppet do the rest. Most of our clients use Puppet Enterprise. So the examples contain a full blown implementation using Puppet Enterprise 2005.2. But sometimes it is easier to get started using a masterless approach. So you can run the examples masterless as well. The starter packs allow you to use the Puppet modules on all of your systemsfor the period of one month. Every company is only allowed to use a starter pack once per product. When you apply for one or more of the starter pack we require you to supply all address information, including a valid company email address and aphone number. If you need support, contact us so we can discuss the options that best suited for you. The starter packs don’t include support.